OHSOGRAY chatted with host Wil Willis about what makes the show unique and why everyone can appreciate the craftsmanship that goes into weapon forging. 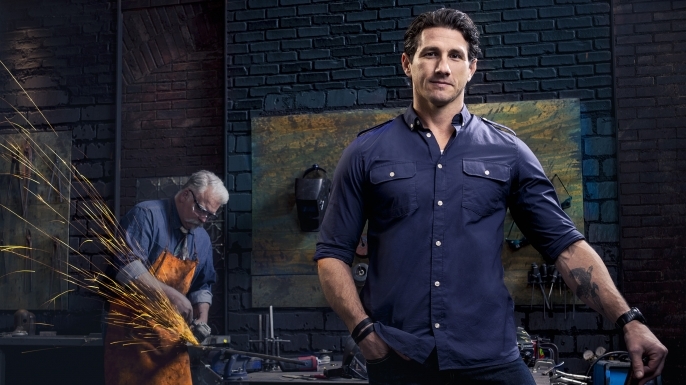 Forged in Fire premieres June 22nd at 10/9c on History. How did you get involved with Forged in Fire? I already had a small relationship with Leftfield Pictures. I appraised a couple military items for another show that they produced called Pawn Stars. They called me up in February and asked me to fly out for a meet and greet and screen test with a couple of the judges and the rest is all history, as they say. What was it about the project that drew you to it? Are you saying there are no women on the show? We tried! We really did try to get a couple of girls involved. I think it’s one of those things that’s really intimidating. How are they going to be? What’s the show going to be like? What’s it all about? I did meet recently a bladesmith who’s female who would have loved to be on the show. I think it’s a matter of reaching out to people and contacting them. You have a military background, right? Do you find that other people in this field also have military backgrounds? No, actually, I don’t. I think that with the type of craftsmanship we’re looking at, a lot of these guys have lifetimes that are dedicated to just making blades. So you’re going to see something that’s kind of next level. I’m not saying that none of them have a military background. I didn’t get to know each and every contestant that well. But to perform the way that they did, I think they really do dedicate their lives to their craft. Had you ever done any work with swords or blades yourself? Yes. When you talk about the military, my military background, bayonets are a big part of that. Knives are also a part of that—whether it’s a rescue knife or a bayonet that’s affixed to the end of my primary weapons system, my experience with knives is more combat orientated. I’m kind of the end user when it comes to weapons. That’s interesting that bayonets are still used in modern warfare. In what context are you trained to use a bayonet? First of all, a bayonet is a tool. It’s something you can use to cut rope. It’s something you can use to chop wood. It’s something you can use to cut concertina wire or barbed wire with. If you fix it to the scabbard appropriately. But as far as the bayonet’s original purpose, it’s purpose today is to kill. You affix it to the end of that riffle and when things get close quarters, you can use that thing to eliminate a threat. Psychologically, people are more scared of a knife than they are of a gun. Everybody’s scared to cut themselves; they know what it feels like. Can you describe the show’s format? It’s a three stage competition series with the first two stages happening at the Forged in Fire set. So the blade use our tools to create a weapon of their own design and it should be a signature blade of their own design. After two rounds of competition, we send the bladesmiths home, where they have 5 days to use their forge to create a weapon that we choose. Then at the end of 5 days, the two remaining smiths come back and their weapons are tested and they’re subjected to the scrutiny of our panel of expert judges. At the end of all that, a Forged in Fire champion is declared. That person walks away with a check for $10,000 and the crown. What are some of the backgrounds of the contestants? We had quite a few guys from Connecticut. [Laughs] We had like four or five guys from Connecticut. So bladesmithing is big in Connecticut. Per capita, they probably have more bladesmiths than anywhere else in the United States. The backgrounds were quite various. We had guy[s] who came from Florida, from Washington, from Utah, from Arizona…. They flew in from all over the United States to kind of show off their capabilities. We had guys from Georgia. And their backgrounds were as diverse as you would expect to see in any crowd of people. Anybody from a master bladesmith all the way down to a guy who thinks he knows how to make blades and kind of tinkers around with it and he wants to see how he holds up against the competition. How about your fellow judges? Who are they? First, we have J. Neilson. Who is an American Bladesmith Society Master Smith. J lives in Pennsylvania—like way out in the woods. He’s a very well respected master smith in the bladesmithing community. I grew to respect him quite a bit for his knowledge, his ability to actually verbalize and define a lot of the terms that bladesmiths use and break it down into simple verbage for me and for an audience. Next you have David Baker, who is a world-renowned swordmaker and Hollywood prop maker. So a lot of times when you have these Hollywood movies that come out and they require rapiers or special gladiuses—period piece type swords, Dave would be a guy who they would call and he’s able to handle that. He’s done work on everything from Deadliest Warrior to sci-fi flicks. I met Dave about seven or eight years ago, the first time. So it’s kind of funny…I met him, hung out with him for a day, and then a few years later, I’m working with him on a show. So that was pretty amazing. Then the last judge is Doug Marcaida. He’s an Air Force veteran, a former respiratory therapist and he’s one of the world’s most respected Kali knife fighters. He’s an edged weapons specialist. He tours the world teaching Kali, close quarter combat. This is obviously a unique world. What will draw audiences in and how will the show appeal to people who aren’t familiar with weapons? I think the appeal is once again, pure craftsmanship. There’s not a whole lot of…we’re not laser cutting steel and then just grinding it down on sanders. So you’ve got guys taking lumps of raw metal, like a ball bearing, heating it up until it’s glowing hot and reaching in with a pair of tongs and pulling out something that looks like the sun, and then pounding that piece of metal into this beautiful blade or work of art. I think that any time people demonstrate a unique capability, other people are going to be interested in that. To see these guys work under pressure, overcome obstacles and even mistakes working towards proving themselves is something that’s going to appeal to people. Another thing that I really like about each and every one of our contestants was the camaraderie that they had with the other bladesmiths. There’s no bickering, there’s no fighting, there’s no yelling matches out there on the floor. It’s all business—these guys doing what they do best and even helping each other out there. There’s almost a sense of community that you see and I really enjoyed that. I think other people will enjoy that, too. [VIDEO] Sneak Peek: DOMINION New Season 2 Trailer!